At ISE 2014 in Amsterdam, Lang AG (Lindlar, Germany) had both a booth and a private viewing room. The viewing room focused on laser/phosphor and pure laser projectors and I got a tour of it hosted by Markus Ries, director of Lang Academy, and Peter Mathia, product manager for projectors. Lang AG is a sales and rental company for professional AV equipment. According to Ries, the company is not a rental and staging company that serves end users directly. Lang acts as a “dry-hire” cross-rental company, serving the market with large quantities of projection, display, LED and image processing equipment. Its customers are not end users, but the rental and staging companies. As part of his duties as product manager of Lang AG, Peter Mathia evaluates projectors that Lang is considering purchasing to add to its rental inventory. As part of this projector evaluation program, there were three demos of laser/phosphor and laser projectors in the Lang viewing room at ISE. Mathia also provides feedback, based on measurements he makes, to the projector manufacturers on the suitability of projector prototypes to the Pro AV industry and suggests modifications to designs that would simplify their use in the field. It is then up to the projector makers to decide if these suggestions can be implemented and then do the necessary design work. The first projector I saw was the NEC pure laser projector. 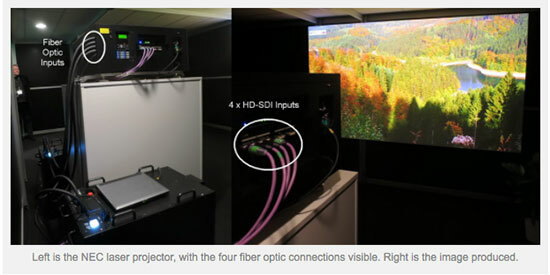 The projector is a 4K, three-panel DLP projector and the lasers are external and connected to the projector by fiber optic cables. Each external laser module provides enough light to produce 5,000 lumens at the screen and the projector I saw was using two modules for 10K lumens. Each laser source was connected to the projector via two fiber optic cables, as can be seen in the photo. The image produced on the screen was excellent, with good colors. Slight speckle was visible in the image when viewed close up, but at normal viewing distances this speckle was invisible. Left is the NEC laser projector, with the four fiber optic connections visible. Right is the image produced. There has been debate about whether laser projectors should have the lasers embedded in the projector itself or if they should be external, perhaps in a central laser room, and connected to the projector via optical fiber. Mathia pointed out to me that these fibers capable of carrying high-powered laser beams cost about $1,000/meter ($305/foot) and this could impose an impossible cost burden on lasers any significant distance from the projector, especially if four fibers were needed to connect the lasers to the projector. The second demonstration was a side-by-side comparison of the DPI HIGHlite 12K laser projector and a lamp-based projector from Panasonic, using dual 355W UHM lamps. The two projectors had WUXGA (1920×1200) resolution, although the DPI projector used 0.67” DLP imagers and the Panasonic used 0.9” imagers. The two projectors were set up for the same luminance at the screen.